HarbourCats baseball is the hottest summertime entertainment ticket in Victoria! Whatever your preference, we have an ticketing option for you! Group Tickets - Got a group of 20 or more that want to attend a game? Perfect! We've got discounted ticket prices for you, plus the option to bundle in meal and drink options. 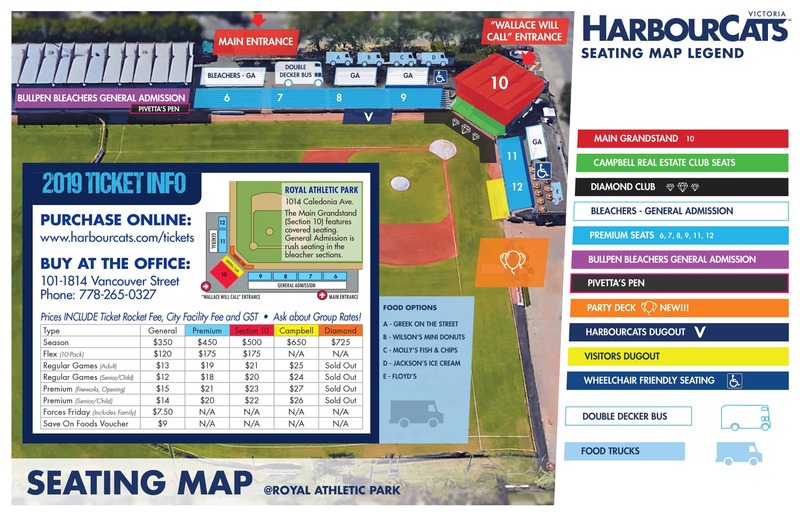 Other Ticket Options - Senior Discounts, Co-Op Member Discounts, Save-on-Foods Vouchers and Forces Fridays are just a number of additional ways to save on HarbourCats tickets this season! Each of these come with a variety of options for seating location and pricing to suit your needs. Click on any of the above links to learn more! On-line, at the office, or at the Park. We offer a number of convenient ways to get your seats! CLICK HERE TO LEARN MORE!